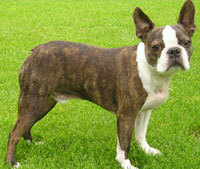 Boston Terrier Dogs - The Boston Terrier is a breed of dog originating in the United States of America. Boston Terriers are typically small, compactly built, well proportioned, dogs with erect ears, short tails, and a short muzzle. While originally bred for fighting, the modern Boston Terrier are bred for companionship. The Boston Terrier can be gentle, alert, expressive, and well-mannered. Many still retain the spunky attitude of the typical terrier, however, they are not considered terriers by the American Kennel Club, but are part of the non-sporting group. Some Bostons enjoy having another one for companionship. Both females and males generally bark only when necessary. Having been bred as a companion dog, they enjoy being around people, and, if properly socialized, get along well with children, the elderly, other canines, and non-canine pets. Boston Terriers can be very cuddly, while others are more independent. This information is licensed under the GNU Free Documentation License. It uses material from the Boston Terrier article on Wikipedia.org. Boston Terrier Breeders - Advertise your kennel puppies and dogs here. Circle J Boston Terriers - Alabama - Home of top quality Boston's for the show ring or just as pets. Beautiful, healthy and guaranteed. AKC registered.